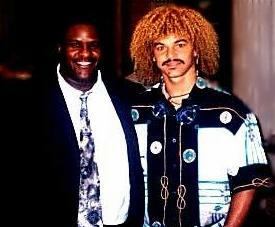 Carlos Valderrama is one of the most experienced and gifted soccer players in the world. He is recognized for his great passing skills able to deliver the ball with pinpoint acurracy to his teammates. As in the case of most great players Carlos Valderrama began his playing days as a child on the dirt streets of his native Columbia, playing with whatever he and his childhood friends could put together to produce a ball. He began his club career in 1981 playing with Columbia’s first division team Union Magdalena. He also played with Millionarios and Deportiva Cali of Columbia before transferring to France’s first division team Montpellier in 1988. In 1990 he moved to Spain to play for Real Valololid. He returned to Colombia in 1992 to play for Deportivo Independiente Medellin…Returned to Atletico Juniors in 1993 and remained there until joining the Mutiny in 1996. He is married to Clairbeth, with three children. He was the MLS league Honda MVP in 1996 and is a three-time MLS Allstar. Right – Gerard Robbins with Carlos Valderrama. During recent years, La Cancha has interviewed ”El Pibe” on several occasions. As always, Valderrama was found to be open and eager to express his views. We’ve discussed his playing career in America, youth involvement in the sport, and importance of quality playing surfaces the “cancha”. In our most recent interview, Valderrama provided our us with his thoughts about Women’s World Cup ’99 and his opinion on how the WWC ’99 will impact on the sport in general. Q: Has it been difficult for you to make the adjustment of playing here in America? A: At first it was difficult due to the culture, food, and weather however I really enjoy living in America and being a part of this country’s futbol league. Q: Can you share with our readers what you believe to be one of your most memorable experiences here? here. That experience was being a part of my country’s national team which participated in the 1994 World Cup. I was surprised by the joy of the American people. Because soccer is not the number one sport here in America I did not expect to see the stadiums filled the way they were. opinion makes for a quality surface. A: The stadiums and grass surfaces during the World Cup were very good. America futbol fields are better in general because of the technology and money here. For me, a good surface is one which is evenly cut. I prefer the grass to be cut short so that the ball can roll faster. It take less energy for the player to run and move the ball on a low cut surface. Q: Well, there is no lower cut surface than the astro turf surface that is installed in stadiums like Giants Stadium. What is your opinion of that surface as compared to natural grass? A: On the artificial surface the game is much different. The ball moves faster and bounces. I prefer the natural grass because it is easier to control the ball. There is also a greater possibility for the player to get an injury on the artificial surface..
Q: What did you think of America’s Women’s World Cup which was recently held? A: I was surprised to see the support of the Americans for the Women’s World Cup. Like the men’s game in 1994 the stadiums were full and there was much excitement. I believe that the success of the Women’s World Cup will help the sport grow not only here in America but other countries as well. Q: What are your thoughts on the USA women’s team. Why do you think they were so successful in comparison to the American men’s team. And who if any of the women’s team members made an impression on you? A: The USA women’s team played very well. I was very impressed. However you cannot make a comparison between the men and women teams because the competition is different. Women playing soccer has not been encouraged or supported in many other countries. It is my understanding that the American women’s team has played for many years together. This is one of the reasons why they (the USA) were successful. Q: Which of the American women players impressed you the most? A: There were many good players. in all of the countries. But as far as the USA team, I was impressed with number 10 (Mitchell Akers). She played a very good defensive game and because of her, the American team was able to keep possession of the ball. Q: What do you believe will be the impact of the Women’s World Cup on the woman’s game and soccer in general in America. A: The Women’s World Cup was very good for the sport in America. Many people who saw only the men play were impressed with the woman. as well. I think the recent games can only help the growth of soccer here. There will be many more girls interested in playing futbol as a result of the games. Q: It has been said that even though football, baseball and basket are America’s main sport more children play soccer in America than those sport. Why do you believe this is so? A: Soccer is a sport that most children can play. In all countries the child can play futbol wherever there is space.We used whatever we could make as a ball. Also, the child does not have to be strong. These are some of the reasons futbol is played in almost every country. It (futbol) is a sport that does not require much equipment or expense. For kids it is a good way to meet new friends and develop discipline and good physical conditioning. Q: Getting back to the MLS, How do you access the league’s success or performance. A: Even with the passing of several years, the league is still a new here. Over time the problems will be solved and the league will continue to grow. With television and radio this sport will become more popular in the United States.